Well, it's 1:15 p.m. on Tuesday December 30th. There are only 1 and a half days left in 2008. This year really has been absolutely incredible and I'm totally looking forward to 2009. In my life, I have been "obsessed" with my body image since I can remember. I've lost weight - I've gained weight - lost it again and gained it...AGAIN! A year and a half ago - in October of 2007 - I was diagnosed with "Insulin Resistance" - which basically means that my body turns sugar straight into fat and it's incredibly difficult, if not impossible, to lose weight. As of today I am 5'8" and weigh around 192 lbs. I would LOVE to lose 20 pounds and just stay at 170 pounds for the rest of my life. That would be fantastic!!! And some may say that 20 pounds isn't a lot, especially since I've done it before (shoot, I've lost a total of 60 before!!!) - but now that I'm IR it's close to impossible. Plus - in all honesty - I'm just not as "obsessive" as I used to be about eating right and exercising. Now, don't get me wrong, I DO still try to "eat right" - and it's NOT like I pig out - but I think it's more the fact that I've just gotten so frustrated over ALWAYS eating right and ALWAYS exercising and seeing little to no results that I've almost given up. Plus - I know that before it was always about losing weight to find happiness / find a boyfriend, etc...and I know that's NOT the right reason for losing weight - but that was the main reason I always dieted...and now - well, I've finally found the most incredible man EVER who doesn't mind a pound or two extra on me and doesn't make it a big deal at all. In fact, we just bought a house together and our wedding is June 26th, 2010. But. This blog. Why I'm here. I'm here because I DO want to lose those 20 pounds and keep them off. PLUS - the medication I'm on FOR the Insulin Resistance - well whenever I eat a VERY high carb meal, I get "sick" and I am sooo sick and tired of GETTING sick! I'm really not supposed to eat (bad) carbs and I need to re-adjust my lifestyle so that I'm NOT eating bad carbs anymore. 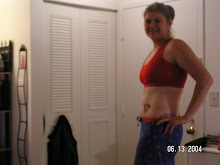 Last year I did follow the weight watchers CORE plan, which worked for me. I went from 197 (which is where I got up to again after having been down to 160 three years ago on the weight watchers POINTs program...) - but I went from 197 down to 180 and then I stopped going to the gym and stopped eating "right" and I've gained back 12 pounds again. My wedding is in a year and a half though and damnit - i WILL wear a smaller size wedding dress than i've already tried on! you know? oh well - i'll be back on here sporadically to talk about things and update my progress.